Number of Positions: 25 Position. Mounting Style: Wire. 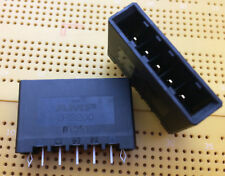 Manufacturer: AMP (These are original AMP product). Shell Material: Steel. Made in USA. Subcategory: D-Sub Connectors. Gender: Male. High Density D-Sub Connectors. Each kit contains all the parts shown in Picture #1. We don't have any idea who made them or why. The white plugs are marked "MXS and 1 2 3 4.". The beige plugs are marked "81138/. TOP" with a "W" logo. FFC&FPC Connector x5. Pin Pitch：0.5mm. Number of Pins：40Pin. Cannon part no’s JC SOB 27133 Item 7 JPM 6 AB MK2. There may be a little tarnish on the pins which could easily be removed with a little siver dip. Similar to the old Jones type plug. FFC&FPC Connector x5. Interface Type： ZIF. Pin Pitch：0.5mm. Trailer Wiring Connector Extension; Fits 2 Pole Flat Plug; 12 Inch Length; Single. We will list them right away. FLAT CABLE CONNECTOR. 10 PCS . ROW 2 x 10 SPACING. 1" (2.54 MM). FLAT CABLE CONNECTOR. ROW 2 x 25 SPACING. 1" (2.54 MM). FLAT CABLE CONNECTOR. ROW 2 x 17 SPACING. 1" (2.54 MM). 10 PCS . FLAT CABLE CONNECTOR. ROW 2 x 30 SPACING. 1" (2.54 MM). FFC&FPC Connector x5. Pin Pitch：0.5mm. Number of Pins：50Pin. 4600 Series;. Plug, Wire Mount;. Accepts flat cable or discrete wire. 2.77 in.L x 0.25 in. H x 0.16 in. NIB : New in bag. 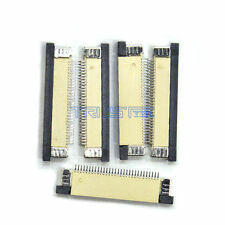 Conn Socket Strip SKT 8 POS 2.54mm Solder RA Thru-Hole. Socket Strip. Right Angle. Through Hole. Product Length (mm). Product Depth (mm). Mating Cycle (Cycles). Number of Rows. Platinum Tools 106125 RJ-12 (6P6C) Flat-Stranded Connector, 500 Piece Condition: New. Part Number: 106125. Manufactured to comply with FCC 68 guidelines and are UL listed. 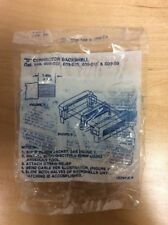 Platinum Tools 106110 RJ-11 (6P4C) Flat-Stranded Connector, 500 Piece Condition: New. Part Number: 106110. Manufactured to comply with FCC 68 guidelines and are UL listed. Platinum Tools 106100 RJ-22 (4P4C) Flat-Stranded Connector, 500 Piece Condition: New. Manufactured to comply with FCC 68 guidelines and are UL listed. Part Number: 106100. 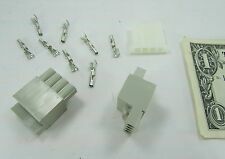 Trailer Wiring Connector Kit; 4 Wire Flat; 48 Inch Vehicle And 12 Inch Trailer; With Wire Functions Printed On Wire For Reference. 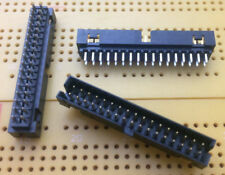 Manufacturer: TE CNTY - AMP. SMT Compatible Yes. 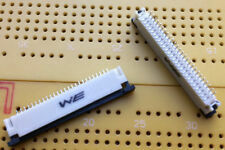 SMT Soldering Temperature 220.0 °C. SMT Soldering Temperature 428.0 °F. Connector Type Connector Assembly. Data Sheet Tail Orientation In-line. Make First / Break Last No. Platinum Tools 106100 RJ-22 (4P4C) Connector Flat-Stranded. 500/Bag. Model No: 106100. Our Model No: 106100. Round & flat cable versions. Manufactured to comply with FCC 68 guidelines and are UL listed. We will list them right away. SLAWMIR Electronics. Platinum Tools 106143J RJ-45 Flat-Stranded Connector, 100 Piece Condition: New. Part Number: 106143J. 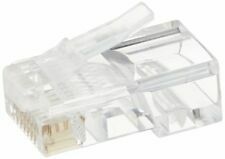 The Platinum Tools 106143J RJ-45 (8P8C), Flat-Stranded is a traditional crimp WE/SS-style modular plug. Platinum Tools 106128J RJ-12 (6P6C), Flat-Stranded Connector, 100 Piece Condition: New. Part Number: 106128J. Manufactured to comply with FCC 68 guidelines and are UL listed. Platinum Tools 106113J RJ-11 (6P4C) Flat-Stranded Connector, 100 Piece Condition: New. Part Number: 106113J. Manufactured to comply with FCC 68 guidelines and are UL listed. FLEXSTRIP® jumpers are multi-conductor board- to -board interconnect devices. 10 Way 76.2mm Long FLEXSTRIP PCB ConnectorFLEXSTRIP Series. 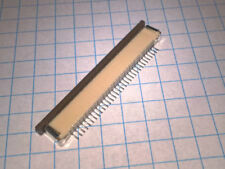 2.54mm TE Connectivity Flexstrip Range. These jumpers are suitable for use with the FLEXSTRIP® sockets range. We will list them right away. located in Warsaw, Poland. Platinum Tools 106103J RJ-22 (4P4C) Flat-Stranded Connector, 100 Piece Condition: New. Part Number: 106103J. Manufactured to comply with FCC 68 guidelines and are UL listed. Platinum Tools 106125 RJ-12 (6P6C) Connector Flat-Stranded. 500/Bag. Model No: 106125. Our Model No: 106125. Round & flat cable versions. Manufactured to comply with FCC 68 guidelines and are UL listed. FLEXSTRIP® jumpers are multi-conductor board- to -board interconnect devices. 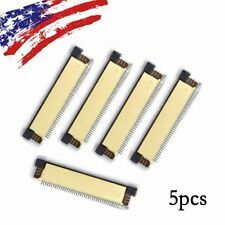 15 Way 50.8mm Long FLEXSTRIP PCB Connector. 2.54mm TE Connectivity Flexstrip Range. These jumpers are suitable for use with the FLEXSTRIP® sockets range.